The benefits of more responsive supply chains are understood, but creating agile processes , especially for warehouses, to improve Customer experience can be a challenge. Several new technologies have emerged to help create flexible warehouses. Warehouse or yard applications that record static location data have limitations, since they are only as good as the data accuracy in them. In addition, the 'overhead' associated with systems implementations can be expensive. We are not challenging the idea of a WMS at all. It provides a whole suite of capabilities that are necessary. In this article we are focusing on agility and new techniques that bring flexibly to your warehouse management, so that you can reap the benefits of a more responsive supply chain. 2. In spite of the best of intentions, items are frequently not 'where you put them,' since goods and containers keep getting moved. Barcode scanning has helped to some degree, but what really works well is a warehouse that can support a 'fixed location' (binning) environment. This video demonstrated the problem quite well. Certain product groups or warehouse service providers need to deal with a very dynamic business environment. Products, their dimensions and the demand for them keep changing, and a traditional bar-coding/WM system is insufficient for providing the necessary flexibility. So real-time locating systems in the last decade promised a more flexible factory or warehouse. The premise was that with auto-id, I could put things anywhere and find them again. Using this type of system, when circumstances changed, space could be allocated as needed. But in reality the cost of 'active 802.11' devices was too prohibitive, and passive technology still had limitations in readability at range. However, this concept was so compelling that innovators have been chipping away at the problem for several years. Two examples stand out as the next stage in agility and I think, each in their own way, address the issue of flexibility in the facility. One solution I have seen from Rush Tracking is their VisiblEdge. It combines several technologies to complete the solution: RFID, an Optical positioning system, from Skytrax, that has laser height sensors, and software. RFID provides location and Skytrax provides height and depth, so that a precise location of the item in three dimensions can be found. 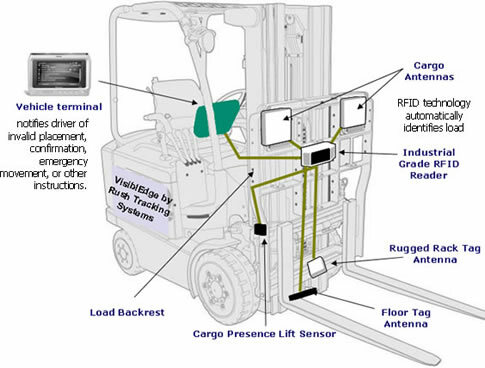 With RFID, then, the specific carton, pallet, tote or item can be picked. 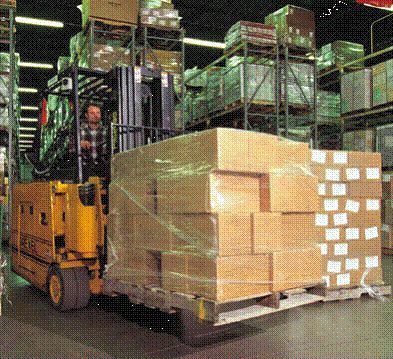 The software records the load so the picker and the back end system know the item has been picked, and also know the precise load and location of the picker (forklift). More strategically, the optical positioning systems can be implemented, like many warehouse or yard applications, with a wireless grid in the ceiling or floor of the facility. These grids provide the two dimension locations in the warehouse, and you can ultimately restock and reconfigure your space at will. This works particularly well for bulk environments, but are not exclusively for that. Many firms struggle with fixed designs and implement rigid methods for put-away in the hope that the warehouse stays organized. But that is hard to achieve. VisiblEdge blends or adds on well to your existing investments in equipment (forklifts, readers, WMS, etc.) And for users who have not made these investments, it gives you a window into a different approach for designing new and more flexible space. Another huge challenge in warehouse is the 'one each' business, consumer fulfillment. Firms who have a catalog or ecommerce site know all about this challenge. Elaborate and expensive warehouse equipment has been built over the years for these picking systems. Designing these is daunting. If you 'guess wrong' on design or your business changes you are stuck with a million dollar, (or more) system. And if really good news strikes, with sales growth, it's hard to scale up in time. I recently visited Quiet Logistics whose fulfillment operations master this challenge for their customers. Based on Kiva System's robotics and software (see video in action) Quiet has a fully scalable (and transportable) operation. Flexibility is the key here. Items can be put away anywhere and when it is time to pick, the software determines the most efficient routes and the robots do the picking. One of things I found interesting about Quiet as a fulfillment operation is this: In many outsourcing contracts, customers have to be precise about how much space they will use and that space is allocated to them. As seasons change, it is hard to scale up or down. In addition, the operator is loathe to 'borrow' space from week to week as one client needs space changes. I have walked many third-party warehouses with signs over empty spaces with customers' names dangling from the ceiling. This hardly lets the fulfillment business determine the optimal approach for serving their customers best. Another critical point for the retailer is the time it takes to pick and ship. Old conveyor models may not be economical for a 'one each' in certain circumstances. For example, if a user is online at 8 pm (well within the late "hour" for Fed Ex or UPS air), the item probably won't be picked until the next day. Here a robot can go fetch the item and have it on its way. This keeps the 'buying window' open longer each day and improves customer experience with true 24 hour (or less) receiving. Leveraging existing bar-coded labeling used in retail makes transition to this approach straightforward.